This document contains the unabridged text of the Auckland Regional Council's discussion document (in black), augmented by our comments (in blue). The submission form has been isolated as a separate document for ease of printing. The A4 map referred to as Figure 1 is also available, and figure 2 has been simplified and placed inside the text, for ease of reference. Underwater photographs have been added to show what the best of the marine environment looks like. The Tawharanui Marine Park was established in 1981 by the then Auckland Regional Authority using provisions from both the Fisheries Regulations and the Harbours Act 1950. The Fisheries Regulations that apply to the Marine Park prohibit the taking of all marine life. The Tawharanui Marine Park is living proof that marine reserves with total protection can be created under the Fisheries Act. There is no difference in degree of protection compared to that provided by a marine reserve, and such parks should rightfully be called marine reserves. The reason for the proposed change of state can be explained as a waste of public money or as a mischievous plan to place all protected areas under the inflexible and central management of DoC. Studies have shown that whilst some species have flourished under the marine park regime, others have not. It is believed that illegal fishing in the marine park may be to blame. The Tawharanui protected area provides tacit proof that coastal marine reserves do NOT work. Since its inception it has performed poorly - not because of poaching but because of marine degradation. Note the use of the word believed, since there is no proof to substantiate this argument, even after twenty years of management and research. The existing restrictions on the taking of marine life from within the marine park will continue to apply. The boundaries of the marine reserve will undergo a minor alterations to enable clearer identification of the boundaries of the reserve. The area is increased by about 30%. Fishing in the area subject to the boundary alterations will be prohibited. Protection within the reserve will be improved due to the public’s better understanding of what rules apply to marine reserves, and through improved compliance and law enforcement. Why not educate about the reserve as it now stands, and enforce the law for improved compliance? If compliance is the problem, fix it. In order to effect this change, the Council needs to make an application for a marine reserve to the Director General of Conservation under the Marine Reserves Act 1971. Prior to making this application, the Council seeks your views on the proposal. A response form has been incorporated. Click here to print this form. In order to assist the ARC in making this application please write or complete the reply form attached and return the completed form to the ARC by 31 March 2003. The submission deadline is now 30 June 2003, but even so most people have had insufficient time to respond, either because they were not aware of this plan or they have not had sufficient time to inform themselves. In this respect, the ARC has done too little advertising, has not called for public meetings earlier on and has spent no time educating the public. This may conflict with its statutory obligation of widespread consultation as the Act demands. If you would like further information please contact Alan Moore on Phone 366 2000 ext 7058 or email alan.moore@arc.govt.nz. ii. a lack of compliance with the prohibition on taking of marine life and effective law enforcement. i. the marine park is located in a typical part of our coast, which is by far less spectacular than Goat Island. ii. it has a very narrow subtidal rocky shore; no shelter; few niches; poor crayfish habitat. iii. it is under the direct influence of the Whangateau Harbour, whose dirty waters often foul the marine park. iv. it has degraded considerably in the past 15 years. v. it proves that marine reserves can no longer work in coastal waters. In order to overcome this, the ARC is proposing to apply to the Director General of Conservation to change the legal status of the area from a marine park to a marine reserve. It appears that the ARC is taking the easy option out of its obligation under the Biodiversity Strategy, which demands that local and regional councils actively promote marine reserves in their areas of jurisdiction. However, since the Biodiversity Strategy in itself is flawed, would the ARC have the courage to do the logical thing - do nothing? The purpose of the discussion document is to seek comment from selected individuals and groups on this proposal. These comments will be used to amend the proposal. The revised proposal will then be put to the Director General of Conservation as an application for a marine reserve under the Marine Reserves Act 1971. Tawharanui Marine Park is located on the northern side of the Tawharanui Peninsula which separates Omaha Bay from Kawau Bay and is approximately 90km north of Auckland City (Figure 1). The marine park abuts and complements Tawharanui Regional Park, which is managed by the Auckland Regional Council. The Auckland Regional Authority established the Tawharanui Marine Park in 1981. The park was promulgated using regulations under the Fisheries Regulations and the Harbours Act 1950. It was the first marine park established under this legislative regime. By comparison, the Goat Island marine reserve was gazetted in 1975 but was opened in 1977. It is more senior by 4 years. The Fisheries Regulations were used to protect all marine life within the park. They do so by prohibiting the taking of marine life. The Harbours Act was used to control activities and structures. The Grant of Control ceased to exist in 1991 with the enactment of the Resource Management Act. After the success of the Tawharanui Marine Park a number of other marine parks were established including Mimiwhangata Marine Park on the north-east coast north of Whangarei and the Sugar Loaf Island Marine Park near New Plymouth. If it was a success, then why change it now? The geology of the marine park mimics that of the adjacent Tawharanui Regional Park. The western end of the marine park is characterised by exposed beaches overlying greywacke bedrock. Low unmodified dunes back the beaches. The dunes are colonised by a typical array of sand dune plant species including pingao, a regionally rare native sand sedge. This area is also a nesting site for the rare New Zealand dotterel, the threatened variable oystercatcher, and pipits. The beaches support populations of a fauna typical of exposed beaches, tuatua bed occur near the lower tide mark and scallop beds are found in deeper offshore areas. The beaches are broken by two rocky reef areas referred to as “Comets Rocks” and “Phoenix Reef”. These reefs hold numerous rock pools which support a range of inter-tidal organisms. It is sad that the above statement has not been verified before going to print. Please point out where these shellfish beds are still present today. To the east of the beach area, the inter-tidal platform becomes more extensive, and unstable boulder beaches occur. Caves and archways feature on this part of the coast. An interesting feature of the park is that the greywacke bedrock contains an abundance of marine fossil deposits (Sporli and Grant-Mackie 1976). This rocky area is characterised by inter-tidal and sub-tidal reef communities typical of exposed northland environments. Forty species of fish have been recorded within the marine park, including eagle ray, yellow moray eel, longsnout pipefish, red banded perch, butterfly perch, kingfish, silver drummer, blue maomao, banded wrasse, leather jacket and red moki. A summary of the fish species observed in the marine park is given in Table 1. Crayfish (spiny lobster) are common in rocky areas and cetaceans, in particular dolphins, are commonly observed within the park. The last time that an underwater survey was carried out, is a long time ago. Since then the underwater environment has deteriorated substantially. For instance, crayfish are no longer common here. In 1998 about 85% of all crayfish walked out of the Goat Island marine reserve after a prolonged period of mud storms. It was not noticed by scientists. The same may have happened here. Last survey date is 1996. The common roughy belongs to cooler waters, and is not found here. Some species on this list can no longer be found or have become rare. It is notable that butterfish are rare here, despite an abundance of their food, the stalked kelp. The images below, provided by us, were taken at the eastern boundary where the environment is least degraded, because of the waves washing it and currents preventing mud from settling out. f033401: Many invertebrate species such as bryozoa have disappeared, as well as sponges. 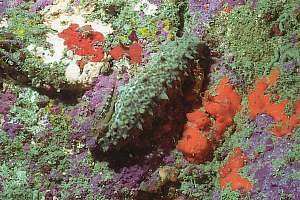 Here the rock is covered in purple coloured pink paint (an encrusting coralline alga), in two places by the orange carpet sponge Crella incrustans. In the top left a salmon coloured colony of invasive matting seasquirts has grown over the red carpet sponge. In the centre a sea cucumber, which mops up the sticky dust seen here as olive coloured dirt. This is one of the best places on the rock. f033403: A similar situation as on left, but here the sticky dust has settled over red algae and sponges. 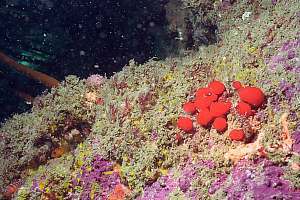 The red blobs in the foreground are opportunistic seasquirts, characteristic of degradation, like the salmon coloured seasquirt mats in the previous photo. On sheltered vertical walls the colourful mosaic of invertebrate life has disappeared. Only in the presence of the washing movement from waves and scouring from sand, does one find it. f033413: near the sandy bottom which cleans this rock by scouring it, grows the hardiest of all sponges, the grey massive sponge Ancorina alata, framed by a stand of stalked kelp. It is an idyllic scene for the untrained eye. 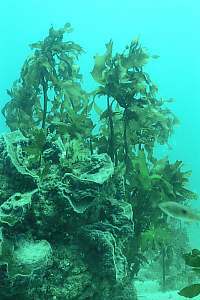 But the kelp is all of same age, indicating mass mortality in the recent past and the sponge is covered in smothering algae and mud (see photo on right). f033415: This is an enlargement of the bottom left corner of the previous photo. Electronic strobe light livens the original colours. It shows how the living world is covered in olive-coloured sticky dust. 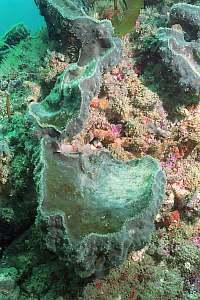 The hardy grey sponge is covered in a smothering mat of green algae and mud. The whitish patch shows the beginning of rot. This is at the reserve's best site. f033409: near the sandy bottom, deep swell may cover flat rocks in sand, which gives rise to sponge gardens as seen here. Such places are now hard to find inside the reserve. This picture shows a regrowth of various colourful sponges, while goatfish find a resting place in between. f033506: Where the stalked kelp degrades, it loses its defence against being grown upon. Its leaves and stalk become slimy while bacteria do their decomposing. Pink mats of fast growing bryozoa cover it, while taking all sunlight away. From here on the end comes quickly. The Tawharanui Regional Park (588ha) is owned and managed by the Auckland Regional Council. The Regional Council has committed to manage the regional park as a “Mainland Island”. This involves the removal of all exotic pests – rats, hedgehogs, ferrets, stoats, weasels and possums, and the establishment of a predator proof fence to stop recolonisation. This purpose of the mainland island is to manage the area in a predator free state, thereby enabling the re-establishment of populations of endangered species, currently largely confined to predator free offshore islands. The change in status from marine park to a marine reserve will complement this management regime by creating an area of minimal intervention both above and below mean high water springs. The Tawharanui Peninsular will become one of a few areas in New Zealand where both the mainland and the adjacent marine area are managed in as close to a “pre-human” situation as is possible. The marine area has already for 22 years been a no-intervention area. The pre-human dream is just that, a dream. The peninsula has been modified into farmland, its natural forests burnt and its top soils lost. It will take many hundreds of years to regenerate. By contrast, the sea takes only a few decades to recover from the ill effects of fishing. Yet this has not happened, even after two decades. When will the ARC wake up to the fact that it will never happen? When will they realise that the health of the marine environment is deteriorating year by year? Integrated land-sea management is a myth. Tawharanui Regional Park is very popular, with visitor numbers of around 160,000 per year. Of these approximately 65% come from the Auckland urban area (Auckland Regional Council and National Research Bureau 2000). Walking and beach related pursuits, including surfing, are the most common activities. The park offers excellent diving and snorkelling experiences. Fishing is provided for outside the marine park on the eastern tip and south coast of the Tawharanui Peninsula. Surfcasters also use the western edge of Ocean Beach. Visit the park on any day, and one sees nobody snorkelling or diving there, partly because access to the most interesting places is poor, but mainly because the sea is not as interesting as near Goat Island. Be aware that snorkeldivers do not see environmental deterioration because they move in a zone cleaned by wave wash. The marine park forms part of the education and interpretation programme for the Tawharanui Regional Park. An ecology trail for the park incorporates both terrestrial and marine components. An interpretive display within the Regional Park buildings promotes the conservation of marine life. Park Rangers also take visitors for guided walks and include discussion of the marine park. Education is aimed at the terrestrial environment. The area of the Tawharanui Marine Park has been subject to significant biological monitoring. Monitoring commenced prior to the establishment of the marine park in 1977 and was continued annually until 1983 (Grace, 1978, 1979, 1980, 1981, 1982,1983). Monitoring was also undertaken in 1989, 1991 1994, and 1996 (Grace 1989, 1991, Marine and Environmental Research 1994, Nuthall and Russell 1996). A study of spiny lobster movement within the marine park has also been undertaken (Kelly 1996). Monitoring has demonstrated that there has been a dramatic increase in the number and size of spiny lobster. Kina density also appears to have increased. There has, however, been little change in fish numbers since 1977. Although in 1996 red moki numbers were three times more common inside the marine park than outside, there has been a general decline in red moki numbers inside the marine park and a lack of large fish despite nearly twenty years of protection. Since red moki are highly territorial, this suggests the impacts of fishing pressure or other external environmental changes have not enabled the population to increase. An alternative theory, which is not highly supported, is that that moki are migrating outside the marine park. Indeed the first impression of diving in the Tawharanui marine park is "Where are the fish?". With its 3km coast as opposed to 5km for Goat Island, the influence of fishing outside is felt into the middle of the reserve. This won't change with the new boundaries. The eastern boundary runs across a contiguous rocky habitat, promoting the spilling out of fish. But red moki stay resident and they are not fished either. These fish need a sheltered cave or 'moki hole', of which there are none or very few inside the park. Moki feed by sucking hard at coralline turf to catch tiny invertebrates living inside the protection of this hardy alga. This habitat is scarce inside the park. Today the park is grossly polluted by muddy sediment, which is directly or indirectly harmful to most other organisms, including crayfish and their food. Marine reserves are areas of foreshore and sea that have been set aside under the Marine Reserves Act 1971 to preserve habitats in their natural state. In addition to the main purpose of preserving areas in their natural state for scientific study, a number of other benefits accrue from marine reserve status. 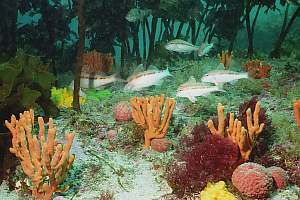 These include the recognition and protection of marine habitats and organisms for their intrinsic worth, educational opportunities, new opportunities for recreation and tourism, potential refuge, feeding and nursery areas for fish and other organisms and potential “yard sticks” for assessing the impacts or management of adjacent terrestrial and marine resources. This marine reserve is of little use to the protection of habitat, since it degrades from year to year. It will never attain a natural state. It is unsustainable. It has little value for education because of poor access to the sea and little value of interest. Schools camping here come to Goat Island for their education and snorkelling experience. Tourism has not developed in 22 years and will be unlikely to benefit ever. As a potential refuge, feeding and nursery area, this reserve has no proven value. Neither will it be of value as a yardstick to measure outside fishing pressure by. Research has shown that crayfish and snapper are more abundant inside but what does that mean to fisheries management? 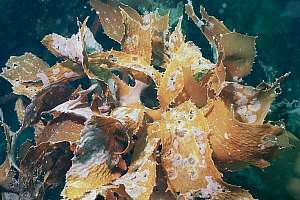 Scientists have not recorded the massive loss in sessile filterfeeders like sponges and bryozoa. The main importance of this marine reserve lies in its value for showing that coastal marine reserves don't work. The Marine Reserves Act is administered by the Department of Conservation. The Department has a mandate to conserve and protect the natural resources of New Zealand, and in accordance with this, a network of marine reserves continues to be established in suitable areas around the country. There are currently sixteen marine reserves as of February 2003. The network idea of marine reserves is a fallacy, lacking proof. It lives only in the minds of protagonists. Of the sixteen marine reserves created so far, twelve are deteriorating badly. They are unsustainable, like this one. The whole network is unsustainable. Within the larger Auckland area, there are three marine reserves. These are the Cape Rodney to Okakari Point Marine Reserve (commonly referred to as the Leigh Marine Reserve), the Long Bay – Okura Marine Reserve, and the Motu Manawa (Pollen Island) Marine Reserve. A fourth area is the subject of an application – Te Matuku Bay at Waiheke Island. The Department of Conservation has significant experience in managing marine reserves, and has staff and resources dedicated to this task. (c) natural features that are part of the biological and physical processes of the marine communities and ecosystems referred to in paragraphs (a) and 9b), in particular those natural features that are outstanding, rare, unique, beautiful, or important. Marine biodiversity is about viable populations of all species. It does not mean that these should not be exploited, since unexploited populations do not exist in nature. Although not applicable to Tawharanui, New Zealanders are more and more demanding a flexible manner of management for protected areas, which acknowledges the importance of sustenance fishing. The Marine Reserves Act does not provide for such flexibility and the method of local or co-management has explicitly been excluded from the Bill. The MRA is out of date and its logical destination is the trash bin. Note that it is not difficult to meet the criteria for a marine reserve. Read the clauses above carefully. Together they mean 'any bit of the sea'. Currently there are a number of marine parks in existence. Each of these marine parks has its own protection regime. The Tawharanui Marine Park is a “no take” marine park, similar to a marine reserve. The Mimiwhangata Marine Park principally protects reef fish species, and does not protect benthic organisms such as spiny lobster and green lipped mussels. Line fishing is allowed at the Mimiwhangata Marine Park provided non-weighted lines are used. At the other extreme, the recently established Hauraki Gulf Marine Park Act which establishes the Hauraki Gulf Marine Park contains no specific protection mechanisms. The Tawharanui Marine Park is effectively a marine reserve and should be called as such. It has created much confusion doing otherwise. The Mimiwhangata Marine Park has never been managed or policed, yet the marine life there does not differ significantly from that at Tawharanui, if the difference in habitat type is taken into account. The Hauraki Gulf Marine Park is just a discussion and management forum. Given the range in level of protection afforded by various marine parks it is likely that people are confused as to what level of protection Tawharanui Marine Park affords. Just calling it a marine reserve rather than park, would have taken all confusion away. What is wrong with that? The term marine reserve relates to no-take protection; not to the Act under which it operates. In order for the Tawharanui Marine Park to be successful, people must exhibit different behaviours inside the park compared to outside. As the sea contains no clearly definable boundaries that can be relied upon, the boundaries of the park must be clear. The northern boundary of the park, near Takatu Point, is clearly marked by twin triangular in-line special marks. Similar markers at the southern boundary near Pukenihinihi Point are poorly positioned and are difficult to see from the water. The seaward boundary of the marine park is set at 0.5 nautical miles from mean high water mark. This boundary undulates in and out with the coast and, without the aid of expensive navigation equipment, is very difficult to identify. The public must be able to clearly identify the boundaries of the marine park in order to change their behaviour. Boundaries should be clear not only to people but also to the marine life which is unaware of maps and straight lines. Boundaries must include buffer zones such that fishing the line or even slightly inside it, does not compromise the integrity of the reserve. The 0.5nm seaward boundary lies well out from the subtidal rocky reef, covering a monotonous sandy sea bottom. Whether it is fished at 0.5nm or 0.4nm does not affect the integrity of the reserve. People can easily gauge this distance. It is wrong to believe that the uncertainty of the seaward boundary has hindered the recovery of this reserve to its natural state. There is no proof either. Why has the seaward boundary never been marked with buoys as has been done for the Long Bay reserve? Given that the level of protection afforded to the Tawharanui Marine Park is similar to that of a marine reserve, and that people in the Region are well conversed with rules associated with a marine reserve, it is considered beneficial to change the status of the area from a marine park to a marine reserve. In making this change, it is opportune to re-adjust the boundaries to simplify them for the public. Instead of the word similar, use identical. A status change will not achieve any of the above. Tawharanui Marine Park has been in place for almost 22 years and has been widely accepted. The park management plan has been reviewed twice since then and there has been general support with no objections to the protection status (“no take”) of the marine park area. The respondents to a questionnaire in 1998, which sought comment on issues for the new draft management plan due in 2000, supported the upgrading of the marine park to a marine reserve (Auckland Regional Council & National Research Bureau 2000). Just watch the reactions at public meetings which are now being called for. The Tawharanui Marine Park is one of only four marine protected areas within the Auckland Region. Extractive uses within the marine park have been prohibited for 22 years. Only the Cape Rodney to Okakari Point (Leigh) Marine Reserve has been in existence longer. The Tawharanui Marine Park was the third marine protected area in New Zealand, following the Cape Rodney to Okakari Point Marine Reserve and the Poor Knights Islands Marine Reserve. As discussed previously, whilst the park has not achieved all the ecological benefits it was thought it would achieve, the ecology of the park is significantly enhanced over the adjacent non-protected area. Only by looking at snapper and crayfish can one think that the park is significantly enhanced over adjacent non-protected areas. Oops, we are talking about the Marine Park; not about the terrestrial park to which CPA1 applies. The northern side (82b) and the tip (82a) of the peninsula are the best examples of open rocky intertidal and subtidal marine habitats on the coast of the Outer Hauraki Gulf. Here is found a small geological exposure of fossils in Jurassic rocks (82c). This is a very rare occurrence in Northland and consequently the exposure is of national importance and has been selected by the Department of Conservation as an Area of Significant Conservation Value (ASCV). The open sandy beaches (82b) are also important as the mobile sands are an important New Zealand dotterel breeding area as well as being a threatened plant habitat. The majority of this area (82b) is included within the marine protected area associated with the Tawharanui Regional Park. Oops again. This is all above water. Given the above, it is clear that the marine park meets the criteria of Section 3(1) of the Marine Reserves Act. The marine park would also meet the purpose of the Marine Reserves Bill, as it is currently written. With regard to the boundaries marine park, the eastern and western boundaries are marked by “special marks”, being red and white triangular in-line markers. As stated in Section 3.2 some the existing boundaries of the marine park are not well situated. The following is an account of the proposed changes. The existing eastern boundary, near Takatu Point, is due north from a prominent headland, and is currently marked by two large triangles (white and red) in-line special marks. When the triangles are aligned the boundary line is true. The seaward is defined out to one half of a nautical mile (972m) from mean high water (MHW )(36º21.3’s, 174º51.7’e). These markers are well located and are easily seen from the sea. The existing western marine park boundary is 650m east of Pukenihinihi Point and is marked by two large triangular in-line special marks located in the sand dunes (36º21.4’s, 174º49.56’e). These markers are not well sited, and as a consequence are not clearly visible from the sea. They ARE clearly visible from the sea. The seaward boundary is depicted by a line half a nautical mile from Mean High Water Mark. This boundary therefore follows the convolutions of the coast and is very difficult to follow without the aid of complex electronic navigation equipment. But it is easy to follow by 'eye-o-meter'. In order to alleviate these issues it is proposed to amend the existing boundaries. Western Boundary It is proposed to move the western boundary approximately 100m to the west so that it sits 550m east of Pukenihinihi Point. This will enable the special marks to be located on the crest of a large dune which is backed by a prominent land contour. This will allow easier siting of the two special marks from the sea. The boundary will extend in a true northerly direction from these marks. There exists no problem relocating the existing boundary to a higher dune. But dunes move. People at sea do not work with true north but magnetic north instead. Seaward Boundary The current seaward boundary is 0.5 nautical miles from mean high water springs. The Department of Conservation promotes straight line boundaries as they are easier to locate on marine charts and can be marked with buoys. It is therefore proposed to straight line the seaward boundary of the reserve. It is proposed to increase the length of the western boundary from 0.5 nautical mile (920m) to 1000m, with the seaward boundary extending in a true East - West direction. This will extend the length of the eastern boundary to 1.1 km. The resultant seaward boundary will be approximately 3.72 km long. Any contour can be marked with buoys. DoC does not have a good record in marking boundaries. For instance the outer boundary of the Goat Island marine reserve has never been marked. It runs at an inconvenient 800m from the shore rather than 0.5nm. The proposed boundaries extend the protected area by about 30%. Why is this not mentioned here? Will the ARC please mention whether the new boundary will be marked with buoys? If not, does it mean that fishing is permitted only for those having GPS instruments on their dinghies? Most importantly, these boundaries can easily be changed today under the Fisheries Act, in fact much more easily than under the MRA. Why is this not proposed as one of the options? The Auckland Regional Council has to date supported research within the Tawharanui Marine Park. The Council will continue to support research at Tawharanui Marine Reserve by encouraging projects especially in partnership with tertiary institutions. Section 10 of the Marine Reserves Act provides for the establishment of a Steering Committee to provide direction for the management of the reserve. Given that the proposed marine reserve will abut the Tawharanui Regional Park it is appropriate that a steering committee be formed to assist with integrated management between the marine reserve and Tawharanui Regional Park. It is therefore recommended that such a committee be established. Why does the Goat Island marine reserve not have a steering committee? What marine reserves need is local management, with the marine reserve's budget. Steering committees are just feel-good talk forums - a waste of effort. In terms of the public, the proposed change from a marine park to a marine reserve will have little effect. Similar rules will apply to that part of the marine reserve which is currently within the marine park boundaries. The main effects will result from the adjustments to the western and seaward boundaries, and the resultant incorporation of a section of sea not currently subject to the marine park protection. People will no longer be able to harvest marine life from the newly incorporated area. However, as the area is relatively small it is considered that this change is not significant. The proposed realignment of the boundaries will enable people to clearly identify the boundaries of the marine reserve and provide the public with greater certainty. The public and the reserve will also benefit from improved compliance and law enforcement, thereby ensuring the purpose of the marine reserve is better achieved. (a) The proposed marine reserve abuts the Tawharanui Regional Park which is owned and managed by the ARC. There is no private land adjoining the proposed Marine Reserve. The ARC has consulted the adjacent land owner who has indicated support for the proposal. (b) The proposed marine reserve is largely based on the Tawharanui Marine Park with the exceptions of a small westward movement of the western boundary and the seaward movement of the seaward boundary. The area surrounding the proposed reserve is open coast with no designated or recognised navigation routes. The proposed classification does not restrict navigation through the reserve. It is concluded that it will not have any effect on navigation. (c) All marine life within the Tawharanui Marine Park is protected under the Fisheries Regulations. Accordingly it is unlawful to undertake commercial, recreational or traditional fishing activities within its bounds. The proposed change in status of the area to a marine reserve will not affect any commercial activity with the area that was occupied by the Park. So what is the point of the whole exercise? Is this proposal intended to mask inept management? Is it an easy way out of ARC's obligation under the Biodiversity Strategy? Of issue however, is the effect of the boundary adjustments proposed in the application. The area proposed to be incorporated is the reserve that is west and seaward of the existing marine park will result in commercial fishing activities being prohibited from this area. The boundary adjustments are minor, and it is considered that the effect is not undue. It is also considered that the any adverse effects are off-set by the benefits of having more clearly defined reserve boundaries. (d) The proposed marine reserve does not restrict recreational activities apart from extractive uses such as recreational fishing. As with the commercial fishing, the proposed marine reserve will not change or alter the recreational activities able to be undertaken within the area of the existing Tawharanui Marine Park. The proposed boundary adjustments will however prohibit recreational fishing from the newly incorporated area. In proposing the new western boundary, it has been located such that recreational fishing can be undertaken on a small section of beach between the boundary and Pukenihinihi Point. This avoids the need for people to use private land to access fishing areas at high tide. This section has been reduced considerably by the boundary change (see map). In terms of the seaward boundary, this will displace recreational fishers between 100m and 300m seaward. There will remain significant areas of Omaha Bay available for recreation fishing in water of a similar level of exposure. It is therefore concluded that the proposed reserve is unlikely to result in any undue adverse effect on recreational fishing. As with commercial fishers, recreational fishers will benefits from more clearly defined boundaries thereby having more certainty as to the legality of their activities. Only if the seaward boundary is also marked with buoys, no more than 0.5nm apart. Why has this not been done before? (e) In terms of (e), previous consultation with Ngatiwai and the Kawerau A Maki Trust have raised issues of traditional fishing. The current marine park prohibits all forms of fishing, including traditional fishing. The proposed boundary adjustments will extend this prohibition over a larger area, however this area is not significantly greater, and the proposed boundary changes will result in greater certainty as to the location of the reserve boundaries. This greater certainty is a significant positive benefit. However, it is recognised that rights under the Treaty of Waitangi and traditional fishing will be of issue. The proposal to change the status of the Tawharanui Marine Park to a marine reserve will in itself cause little effect on users of the area as the rules of the existing marine park are similar to those of a marine reserve. In applying for the marine reserve classification the opportunity has been taken to rationalise the boundaries of the proposal. The resiting of the western boundary and the straight-lining of the seaward boundary results in a slight increase in the area of the reserve. It is considered that this increase in area is not significant and will not result in the failure of the proposal to pass the test of Section 5(6)(a) to (e) of the Marine Reserves Act. What makes the Tawharanui marine reserve unique is that it is NOT managed by DoC. Retain this uniqueness. Although a status change does no harm, it does no good either. It renders control to a centrally led bureaucratic department which is driven by ideology rather than pragmatism. Stop the process now. Give total control to the local community of fishermen, divers and other LOCAL stakeholders. The reserve becomes their baby and compliance becomes a reality. Give them the entire budget too. Listen to their advice re boundaries, marking and so on and support it. Focus on reducing soil loss from the Whangateau catchment area. Auckland Regional Council, 1992. Tawharanui Management Plan. ARC Parks Service. Department of Conservation, 1994. Marine Reserves, A Guide for Prospective Applicants. Grace, R. V. 1978. Tawharanui marine monitoring programme. Report on first year. Unpublished report prepared for the Auckland Regional Authority. Grace, R. V. 1979. Tawharanui marine monitoring programme. Unpublished report prepared for the Auckland Regional Authority. Grace, R. V. 1980. Tawharanui marine monitoring programme. Report on progress. Unpublished report prepared for the Auckland Regional Authority. Grace, R. V. 1981. Tawharanui marine monitoring programme. Report on progress. Unpublished report prepared for the Auckland Regional Authority. Grace, R. V. 1982. Tawharanui marine monitoring programme. Report on progress. Unpublished report prepared for the Auckland Regional Authority. Grace, R. V. 1983. Tawharanui marine monitoring programme. Report on progress. Unpublished report prepared for the Auckland Regional Authority. Grace, R. V. 1989. Tawharanui marine report. Unpublished report prepared for the Auckland Regional Authority. Grace, R. V. 1991. Tawharanui marine report. Unpublished report prepared for the Auckland Regional Council. Kelly, S. 1996. Lobster movement within the Tawharanui marine park. File 8/1/1/7, Auckland Regional Council. 5pp. Kelly, S. 1998a. Tawharanui Marine Monitoring programme: Part I: A review and critique of methodologies and results. Report prepared by Coastal and Aquatic Systems Ltd for the Auckland Regional Council. Kelly, S. 1998b. Tawharanui Marine Monitoring programme: Part II: Proposed changes to the existing scheme. Report prepared by Coastal and Aquatic Systems Ltd for the Auckland Regional Council. Marine Environmental Research, 1994. Tawharanui Marine Monitoring Programme. Report on progress 1994. Unpublished report for the Auckland Regional Council. 30pp. Nuthall, S. & Russell, A. 1996. Tawharanui Regional Park Marine Survey. Unpublished report for the Auckland Regional Council. 30pp. Sporli, K. B. & Grant-Mackie. 1976. Upper Jurassic fossils from the Waipapa Group of Tawharanui peninsula, north Auckland, New Zealand. New Zealand Journal of Geology and Geophysics 19(1) 21-34. The submission form is in a separate document, for your ease of access and printing. Click here.